Baby Feeding Schedule.Second half of the first year. How to choose a car seat for your baby? How to choose baby stroller? Ho to choose a car seat for your baby? Parents often ask which of the many car seats is the best car seat on the market. The truth is, the best car seat is the one that fits your vehicle, your budget, your baby and that you will use properly each time your baby rides in the car. Use the following criteria to determine which car seat is the best choice for your baby. All car seats sold in the U.S. must pass the same federal crash tests. Some car seats may have extra features that make them easier to install correctly, such as built-in locking clips or non-twisting straps. Because proper installation is key in car seat safety, these installation helpers may add safety for some people. However, even the cheapest car seat in the store, with no extra features, has passed the basic crash tests and is safe for your baby when installed properly. Use your baby's height, weight and age to choose the type of car seat to use. Rear-facing-only infant car seats are used through about 20 lbs. Convertible car seats are used rear-facing until baby is at least 1 year old and weighs at least 20 lbs., and forward-facing through the weight limit listed on the car seat. 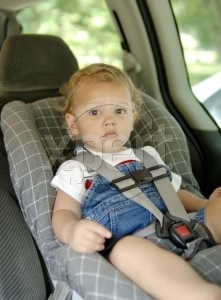 Height-wise, baby's head should be one inch or more below the top of the car seat when rear-facing. For front-facing seats, the tops of baby's ears should be below the seat top. Can You Install and Use the Car Seat Easily? The most expensive, feature-rich car seat is not safe for your baby if you don't take the time to read the directions and install it properly every time it is used. Check the car seat manual to be sure you can install and use the car seat as it is intended. Can you adjust the harness to secure baby in the car seat? Choose a car seat that you will use according to the instructions. Does the Car Seat Fit Your Vehicle? With so many vehicle seat styles, from benches to buckets, not all car seats will fit in every vehicle. It is essential to find a car seat that can be installed tightly, with the proper angle and less than an inch of side-to-side wiggle. Most reputable baby products stores will let you take a car seat floor model to your vehicle, possibly with a store employee, to check the fit before purchase. If not, check the return policy to be sure you can return the seat if it doesn't fit the vehicle. Most recalled car seats are pulled from store shelves when the recall notice is issued. It's still a good idea to check with the manufacturer to be sure your new car seat is not affected by any recalls. If you have borrowed or purchased a used car seat, checking for recalls is even more important. If you also send in the registration card for a new car seat, you will be quickly notified if your baby's car seat is ever affected by a recall. Are Used Car Seats Safe? Steer clear of used car seats if you cannot get an accurate history of the car seat's use. You must know a car seat's crash history to determine safety. Buy used car seats only from people you know well enough to trust their account of the car seat's crash history. Car crashes can cause hidden damage to car seats, and the car seat could fail in a second crash, putting your child at risk of injury. Check to be sure no alterations have been made to used car seats. When buying a car seat, bypass all of the car seat accessories and installation aids. If an item didn't come with the car seat, it's not safe to use it with the car seat. After-market car seat products aren't crash-tested with each car seat and could cause injury during a crash. This includes head positioners (unless it came with the car seat) and seat belt ratchets, which aren't needed if you install the car seat properly. Use of after-market products often voids the car seat warranty. The best way to keep baby safe in the car is to use a car seat with the most crash protection for as long as it fits your baby. You don't have to turn baby forward-facing right at one year and 20 pounds. Many seats today offer higher rear-facing weight limits, and this is a good option to choose if possible. Also look for higher forward-facing weight limits on 5-point harness seats, and keep your toddler in a booster seat as long as possible after he or she outgrows a regular car seat.